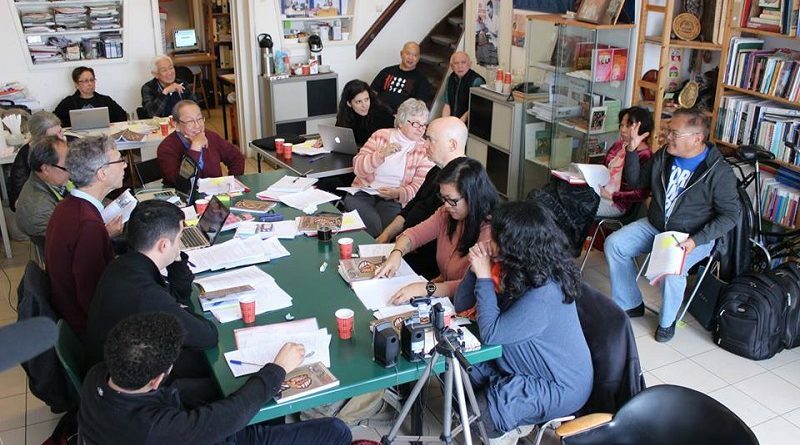 The International Coordinating Committee of the International League of Peoples’ Struggle (ICC-ILPS) held its plenary meeting on April 9-10, 2016. On the first day, at 10:30 am the roll call was made. There was a quorum. The following regular ICC members were physically present: Jose Maria Sison, Malcolm Guy, Antonio Tujan, Veerle Verschueren , Bill Dores, Lyn Meza, Paloma Polo, Bernadette Ellorin and Mohammed Khatib. Alternate ICC member Inti Barrios was also physically in attendance. Michelle Allison and Peter Murphy were represented by proxies. Participating by Skype were regular ICC members Len Cooper, Florentino Lopez Martinez, Elmer Labog, Ramon Bultron, Liza Maza and Jang Chang Weon. Alternate ICC member Rafael Mariano also participated by Skype. The meeting was presided over by the Chairperson Jose Maria Sison, assisted by the General Secretary Malcolm Guy. The agenda was presented, reviewed and approved. So were the minutes of the last ICC meeting. The ICC united in its assessment that the 5th IA was a resounding success and thanked the host country committee for the excellent hosting. The ICC discussed pending issues and business carried over from the last ICC meeting in the Philippines. On the question of self-determination of West Papua, the Chairperson made the following clarification: As a result of revolutionary struggle for national independence against Dutch colonialism and in accordance with international law, the Indonesian people established their nation-state of diverse nationalities or communities and realized their national sovereignty and territorial integrity over all the contiguous areas under Dutch colonialism, including Irian Barat (West Papua). At the same time, the diverse nationalities or communities in the Indonesian state have the right to self-determination and the right to struggle against the oppressive acts and human rights violations committed against them by the Indonesian reactionary government and military. On the question of organizing ILPS delegations to Kurdistan and Palestine, the concrete plans to implement the decision are to be worked out by the concerned ICC members in coordination with the Office of the Chairperson and General Secretary. On the question of conveying the honorific titles to Leila Khaled and Cynthia McKinney, the ICC was unanimous in approving the proposal and directed the General Secretary to inform the concerned about the aforementioned decision of the ICC and inquire from the aforesaid whether they accept the title. Upon the agreement of the awardees, the ICC shall convey to them the title of Eminent Persons in accordance with the pertinent provision of the ILPS Charter. On the proposal to amend the provision on membership dues, the ICC decided to maintain the USD50 for those in the Global South and the USD150 for those in the Global North, with the proviso that organizations unable to afford the USD150 may pay USD75 with an explanation given to the ILPS Treasurer. On the proposal approved by the 5thIA to add a new Commission No. 15 on the rights of the homeless, urban poor and other communities displaced by imperialism and local reaction, the ICC clarified that the next step is to make an amendment in the ILPS Charter and launch the corresponding commission at the 6th IA. The Chairperson, General Secretary and Treasurer made their respective reports to the ICC. The Chairperson reported on the appointments he made to assist the work of the Chairperson and General Secretary and on post 5thIA statements he issued as chief ILPS spokesperson: the Climate Change Conference in Paris; the Erdogan regime´s brutal repression of the Kurdish people; the Trans-Pacific Partnership; the terrorist attacks in Brussels; etc ., as well as the solidarity messages in response to requests from member-organizations of ILPS on the occasion of their conferences and congresses. He also shared his thoughts on the current world situation and the urgent tasks of ILPS in the face of the continuing crisis of the world capitalist system and the growing resistance of the people and struggle for a new and better world. The General Secretary made his report on the work of the General Secretariat after the 5th IA. He announced that the the documents of 5th IA has been printed as a book and is ready for distribution. He reported on the continuing efforts to improve the system of communications between the leadership and the member-organizations, and among the member organizations of the ILPS using available advances in technology. He presented a proposal to publish an ILPS newsletter. The treasurer presented a financial report on the status of ILPS finances. She reported on a positive balance. However, she noted that there was no significant increase in the level of the central fund. The main challenge remains to be to ensure a more systematic and consistent collection of membership dues and creative efforts to raise funds. Vice-Chairperson for External Affairs Florentino Lopez Martinez presented a proposal on how ILPS should build alliances with other anti-imperialist and democratic alliances in order to expand the influence and reach of ILPS. The ICC discussed the proposal and clarified that the Vice Chairperson for External Affairs shall oversee international alliances with broad political character like ALBA, ICOR, the International Action Center, the International Anti-Imperialist Conference while the Vice Chairperson for Internal Affairs shall oversee alliances devoted to specific classes (e.g. workers, peasants, etc.) and sectors (e.g. women, youth, human rights, etc. ) which are already handled by the commissions. The ICC meeting discussed the reports and recommendations of the Commissions. The Vice-Chair for Internal Affairs Antonio Tujan presented the report of different commissions based on the meeting that was held in February 2016 attended by key persons of the different commissions. The report cited the post 5th IA work done and their plans for 2016 including conferences, mass campaigns and organizational building guided by the resolutions approved in the 5th IA. The aforementioned meeting concluded and recommended that the ILPS should address as main issues in the coming year such questions as war and militarism, and the controversial trade and investment agreements such as the TPPA (Trans-Pacific Partnership Agreement) and TTIP (Transatlantic Trade and Investment Partnership). On the basis of a memorandum of understanding submitted, the ICC welcomed, discussed and accepted the offer of PRISM, a progressive research and training institute, to work in partnership and for ILPS to avail of its services. The ICC discussed and approved the proposal of the General Secretary and the Canada Country Committee regarding engagement with the coming WSF in Montreal in August 2016 and decided to assign the ILPS Vice-Chair for Internal Affairs, the General Secretary, the Canada Country Committee and other concerned parties/entities within ILPS to work out the detailed plan. The ICC agreed on the resolutions to be issued on various urgent issues that ILPS should address in the face of current developments in the world situation as a whole and in the different countries and areas of conflict and struggle. Among these are: US-led militarism and war, Turkish State’s genocide against the Kurdish people, declaration of the Federal Democratic Union of Rojava/Northern Syria, state terrorism in the Philippines, Mumia Abu Jamal, the 40th anniversary of Algiers Declaration, the TPPA, TTIP, and other such free trade and partnership agreements. ICC members were assigned to draft the resolutions to be submitted to the Chairperson and General Secretary and in turn forwarded to all ICC members for their consideration and approval. The ICC then set its next meeting on February 25-26, 2017. The meeting was adjourned at 6 p.m. on April 10, 2016.